When I debate one of my leftist friends about deficits, it’s often a strange experience because none of us actually care that much about red ink. And folks on the left want bigger government, so they argue for tax hikes to enable more spending and redistribution. I feel that I have an advantage in these debates, though, because I share my table of nations that have achieved great results when nominal spending grows by less than 2 percent per year. The table shows that nations practicing spending restraint for multi-year periods reduce the problem of excessive government and also address the symptom of red ink. I then ask my leftist buddies to please share their table showing nations that got good results from tax increases. And the response is…awkward silence, followed by attempts to change the subject. I often think you can even hear crickets chirping in the background. I point this out because I now have another nation to add to my collection. From the start of last decade up through the 2009-2010 fiscal year, government spending in the United Kingdom grew by 7.1 percent annually, far faster than the growth of the economy’s productive sector. As a result, an ever-greater share of the private economy was being diverted to politicians and bureaucrats. Beginning with the 2010-2011 fiscal year, however, officials started complying with my Golden Rule and outlays since then have grown by an average of 1.6 percent per year. 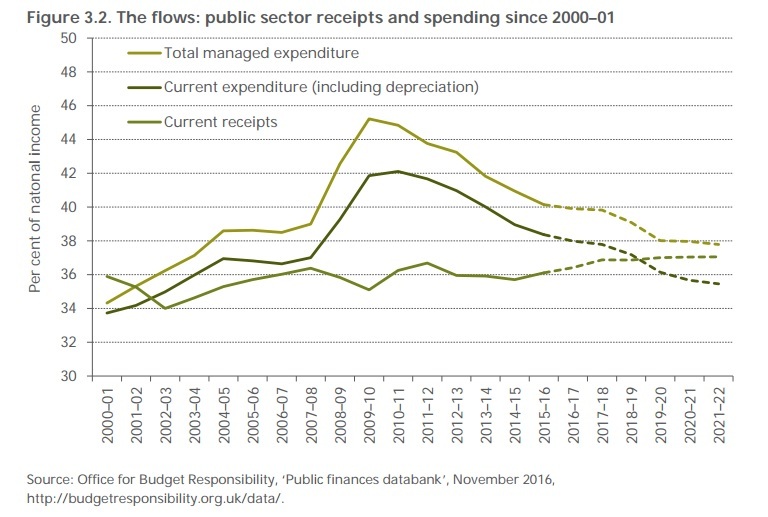 And as you can see from this chart prepared by the Institute for Fiscal Studies, this modest level of fiscal restraint has paid big dividends. The burden of government spending has significantly declined, falling from 45 percent of national income to 40 percent of national income. This means more resources in private hands, which means better economic performance. Though allow me to now share some caveats. Fiscal policy is only a small piece of what determines good policy, just 20 percent of a nation’s grade according to Economic Freedom of the World. So spending restraint should be accompanied by free trade, sound money, a sensible regulatory structure, and good governance. Moreover, as we see from the tragedy of Greece, spending restraint doesn’t even lead to good fiscal policy if it’s accompanied by huge tax increases. Fortunately, the United Kingdom is reasonably sensible, which explains why the country is ranked #10 by EFW. Though it’s worth noting that it gets its lowest score for “size of government,” so the recent bit of good news about spending restraint needs to be the start of a long journey. P.S. The United States got great results thanks to spending restraint between 2009-2014. It will be interesting to see whether Republicans get better results with Trump in the White House.